The Sugar Bowl. The Fiesta Bowl. The Final Four. Orange ya glad we dropped 70 on Clemson? All of these are proud moments in the history of West Virginia University sports. From 2006 to 2012, the WVU Football and Basketball teams were perennial top 25 teams, always in the mix for a conference and even a national championship. Then, in a flash, it all changed. In October 2012, West Virginia University president Jim Clements announced that the school would be buying over 40 properties in the Sunnyside area, and many students living in the area would need to start searching for new places to live immediately. One of these places was Mutts. 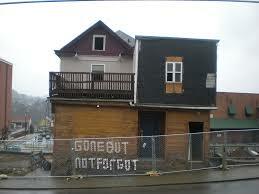 A local bar in Morgantown, Mutts had a longstanding history of being a great hangout spot. Featuring cheap beer, free pool, and a deck, it was a staple to student life at WVU. Students poured into Mutts every night of the week to get drunk, meet girls, and live the WVU lifestyle. The West Virginia University football team had just come off a stunning victory at Texas and climbed to the number 5 spot in the national rankings over the weekend when the announcement was made the Mutts was to be closed. ESPN analysts were praising the high-powered offense the Dana, Geno, and Tavon were orchestrating. Their next game was against the inferior Texas Tech, a team the mountaineers were projected to decimate by double digits. It didn’t end there, either. The mountaineer’s proceeded to lose their next four games and drop themselves into the lowly Pinstripe Bowl, getting blown out there, too. On the basketball court, the mountaineer’s were expecting big things. They were coming off a tough loss in the last season’s NCAA Tournament game against Gonzaga, but were slated to start the season against the same Gonzaga team. It was to be a close game, experts said. WVU was run off the court, losing by 34 points, in what would turn out to be a preview of the entire 2012-2013 season. The team finished the year at 13-19, the first sub .500 season for mountaineer hoops since 2003 and coach Huggins worst season since 1985. The 2013 season was seen as a rebuilding year for the football team, but expectations were still high. WVU was expected to visit at the very least a lower tier bowl game. With the year winding down, the mountaineer’s needed to win two games to make a record 12th straight bowl game. The games were against struggling Iowa State and a Kansas team that hadn’t won a conference game in their last 27 tries, dating back to the 2010 season. The team lost both games. West Virginia University basketball was poised for a bounce back year in 2013. After starting conference play hot, the team proceeded to lose seven of their last ten and fall off of the NCAA Tournament bubble. Just a few days after the final game was played (a loss to Georgetown in the NIT,) Eron Harris, the standout sophomore sharp-shooter who led the team in 3-point percentage and was second in scoring, announced that he would be transferring away from WVU, even though every player would be returning next season. Mutts was closed late in the 2012 fall semester. Since then, the WVU football and basketball teams have gone a combined 36-49. Mutts was not only a bar, but was a way of life. When that life was taken, so was the life of mountaineer athletics.